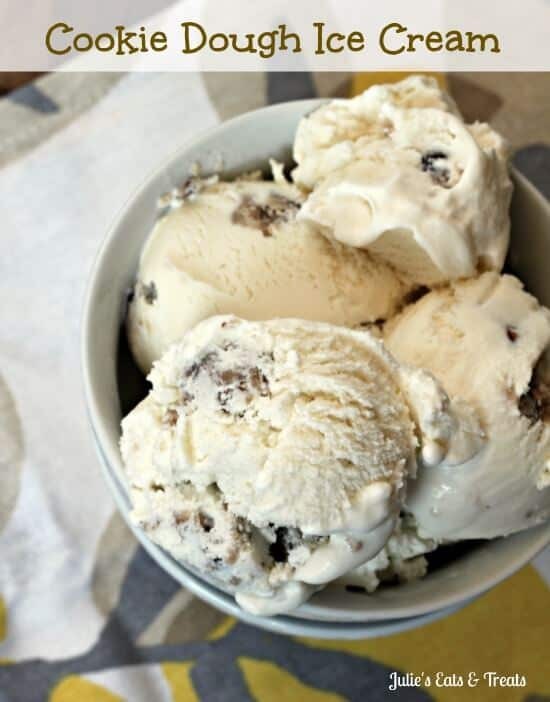 Cookie Dough Ice Cream ~ bits of cookie dough mixed into this smooth and sweet ice cream will have everyone screaming for more! I’m wrapping up my week of ice cream recipes that I made just for you! The last one on my agenda was Cookie Dough Ice cream. I’m a BIG fan of DQ and their cookie dough Blizzard so I knew this one would be a winner in my book. It takes a little extra work to make that cookie dough up instead of just throwing in a few prepackaged cookies like my Nutter Butter Ice Cream and Cookies and Cream Ice Cream, but it’s totally worth it. I made three ice cream recipes this week and each one centers around cookies. I just realized that. Think I might have a cookie obsession? Yes I think it might be. You still love me right? Good. Now let’s continue. I hope you enjoyed this week of ice cream treats and I’ll be back to regular recipes next week! Don’t worry for all you ice cream lovers out there I’m sure I’ll throw in a few more recipes through out the summer. Mix together butter and brown sugar together for the cookie dough until smooth. Add vanilla and mix well then add the flour and combine. Stick the bowl in the fridge or freezer for a little bit and let it harden up a bit so it stays together when you mix it in the ice cream. 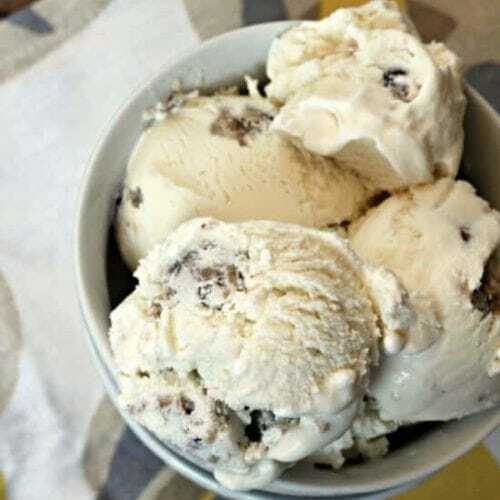 For the ice cream in a large mixing bowl combine, heavy cream, half and half, sugar and vanilla extract. Mix until well combined. Pour into ice cream maker and prepare according to according to directions. In the last few minutes mix in the cookie dough by small teaspoons. This looks delicious. I have an ice cream maker with 1 1/2 qt capacity. Would this recipe work? I use a 2 quart mixer but I think you could do this recipe in the smaller one too. What is half and half , is it milk ?